Gran Turismo 5 is a clean and beautiful as it can be, says Polyphony Digital boss Kaz Yamauchi, but not clean and beautiful enough. All Yamauchi wants to do is making the ultimate driving simulator. It's a pretty singular dream, but one he's yet to make a reality. The problem, he says, is that there's not a PlayStation powerful enough to handle the game he wants to make. In an interview with Esquire UK, Yamauchi said that hardware inevitably constrained any software that was develop for it. He said that the PS was a bigger "vessel" than it's predecessors, but still wasn't big enough to do do everything that Yamauchi wanted. He added that Polyphony had made Gran Turismo 5 as "clean and beautiful as possible," but added that there is plenty more he would have included if he could. It does have to be said that Yamauchi is something of a perfectionist. GT5 has suffered multiple delays while Polyphony tweaked and tuned it, and Yamauchi recently "begged forgiveness," because the game would occasionally drop below 60fps - at a resolution of 1080p, no less - if there was a lot happening on screen. It's hard to shake the feeling that if you took away the hardware limitations of the PlayStation platform, Yamauchi would get so wrapped up in his perfect game, that he'd never actually release anything ever again. 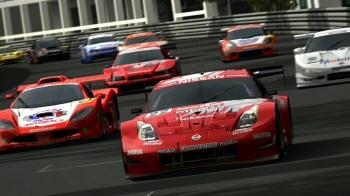 Gran Turismo 5 doesn't have a release date yet, although Sony claims it will be out before the end of the year.